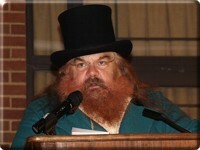 With his wild red beard and ruddy complexion, Elliot MacFarlane looks like a relic from a Scotland long passed. His stature is even more impressive swathed in period dress, complete with a plumed blue bonnet. Despite the oppressive heat, the men and women under the tent are all clothed in layers of heavy cotton and canvas. Every detail of their outfits, from the buckles on their shoes to the trimmings on their coats, was meticulously researched to make the members of MacFarlanes' Company living recreations of Scots men and women of 1745 Edinburgh. 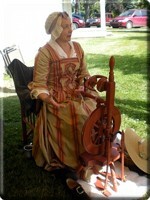 While a woman in a bonnet and striped long-sleeved gown makes thread on a spinning wheel, a man accessorized with a fox-head sporran shows off the company's collection of ancient pistols. MacFarlane himself has wandered a few yards from the tent to where a large group of children have gathered. 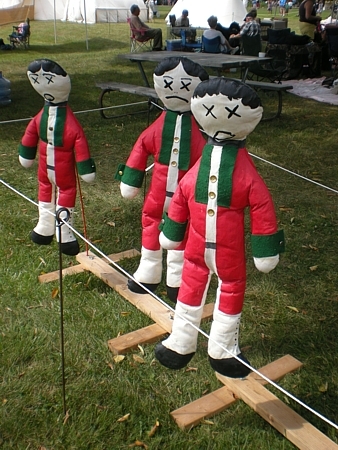 He arms them with wooden swords and lines them up in front of a row of a half-dozen three-foot tall burlap dummies with red coats and Xs for eyes. After instructing the children on how to execute the famous Highland charge, MacFarlane steps aside to unleash the fearsome warriors. 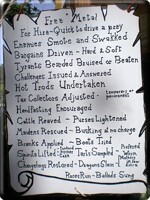 "What's a Scottish festival without killing some English?" 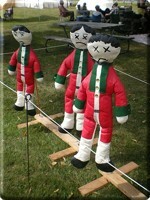 a kilt-clad father chuckles as he watches his daughter beat on one of the dummies with her wooden sword. MacFarlane calls the children off before they cause too much damage to the enemy and commends them for being courageous Jacobites. 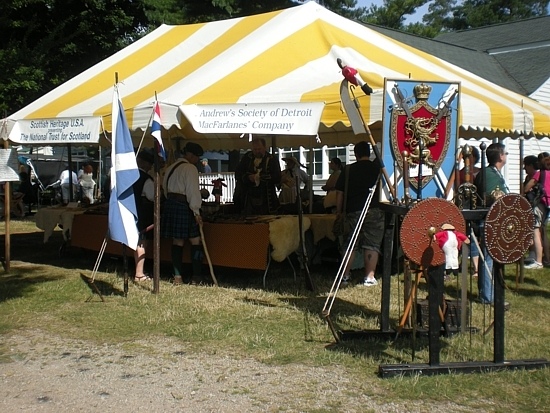 The St. Andrew's Society of Detroit Highland Games is just one of many events MacFarlanes' Company attends during its busy year. Although the Toledo-based troupe participates in numerous festivals and events in Michigan and the surrounding area, its members also trek across the country to participate in events in places such as Alabama, New York, Missouri, and even Bermuda. 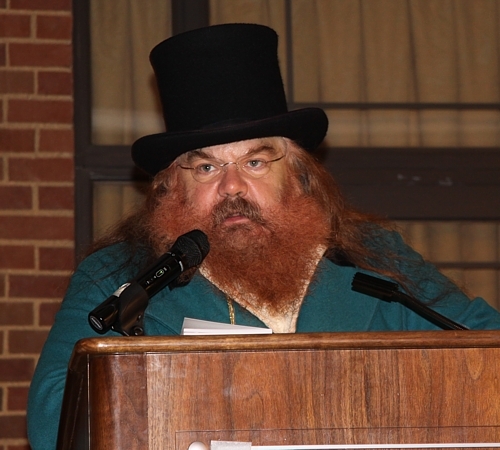 Elliot founded his namesake troupe in 1993, drawing re-enactors, costume enthusiasts, and researchers and historians from across the mid-Atlantic region, including Ontario, New York, Ohio, and Michigan. Since its establishment, it has grown to become a renowned living history and educational organization that works year-round at historical sites and heritage events. Concentrating on the period from 1740 to 1815 (the Second Jacobite Rising through the Napoleonic Wars in Scotland, and the French and Indian War to the War of 1812 in North America), the volunteer troupe uses living history presentations to educate the general public about the rich history and culture of Scotland and the Scottish diaspora in North America (the troupe also gives presentations at schools across North America and Scotland). 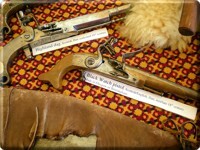 Living history is an educational medium that incorporates historical artifacts, activities, and dress into an interactive presentation designed to give audiences a sense of stepping back in time. MacFarlane himself works for the National Trust of Scotland as a Senior Field Representative in North America, a living history educator and advisor, and a Culloden Battlefield guide. 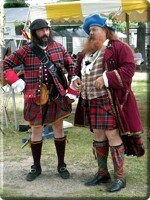 Believing that supporting historical and cultural organizations is an important aspect of being a practitioner of living history, MacFarlane also belongs to Scottish Heritage USA, various costume societies in Scotland, the United States, and Canada, the Saltire Society, the 1745 Association, the Colonial Williamsburg Foundation, the American Society for Eighteenth-Century Studies, the Eighteenth Century Scottish Studies Society, and more. He is also the research historian for St. Andrew's Society of Detroit and Clan MacFarlane Society International, and an elected Fellow of Society of Antiquaries of Scotland, the country's premier organization for historians. MacFarlanes' Company works to raise funds for the support of the stewardship and preservation work of the National Trust of Scotland, with which it collaborates "to encourage an understanding and appreciation of Scotland's unique heritage on both sides of the Atlantic." 1 To date the troupe has raised and donated over $75,000 to non-profit historical preservation and education organizations. 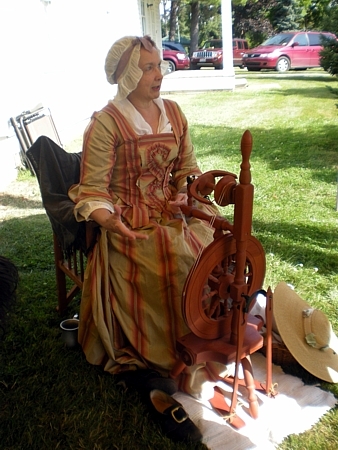 The members of MacFarlane's troupe prepare for each summer festival season by spending the preceding winter and spring engaged in research and travel. The company has earned a great deal of renown for authenticity of the presentations it delivers across the United States, Canada, and Scotland, and the quality of research supporting them. As a representative of the National Trust for Scotland, MacFarlane ensures that all of his events provide the general public with an accurate showcase of Scotland's people, history, and culture. 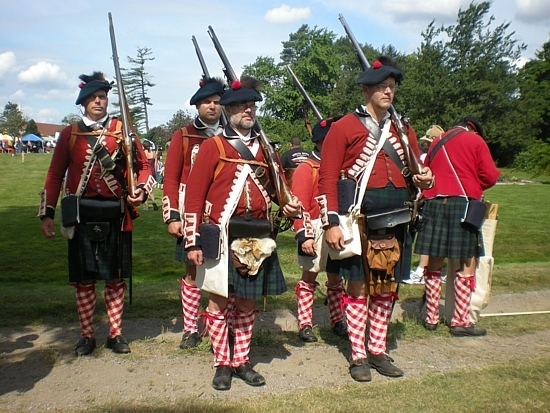 Since April 2000, MacFarlane has been perpetuating this mission with his International Living History Cultural Exchange Program, taking the best of North America's Scottish Living History Practitioners to Scotland to conduct research and deliver costumed presentations for the National Trust at some of the country's most significant historical sites, including Culloden Battlefield, Glencoe Valley, the Scottish Folk Museum, and Stirling Castle. MacFarlane and company have also been guests of Her Majesty the Queen at the Palace of Holyrood House in Edinburgh. "How grand it is that guys like this live the history," lauded military historian Dr. Christopher Duffy and author of The '45. "The work of this group serves to emphasize the important of these events." "These events" include the battles of the 1745 Jacobite Rising, the repression of Highland culture following the Jacobite defeat, the French and Indian War, the War of 1812, Robert Burns, and the daily activities of people who lived in that era. Along with historical preservation, the company also works in museum consultation, engages in research requests, demonstrates for schools and presents at university conferences, and preserves rare and out-of-print manuscripts and periodicals. 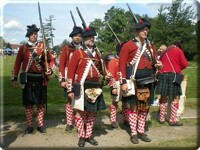 One of MacFarlane's favourite events is Culloden in North America, a living history re-enactment of the Battle of Culloden. Begun in 1998, the traveling re-enactment has been held at sites in New York, Pennsylvania, Ohio, and Ontario, traveling to bring Culloden and its significance to the greatest possible number of spectators. 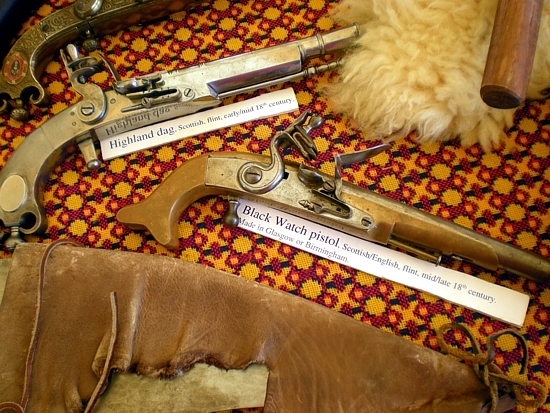 Put on by a confederation of living history companies from across North America, all proceeds from the event benefit the restoration work being done by the National Trust of Scotland at the Culloden Battlefield Park. The organizers and participants believe that this watershed event in Scottish history is an area of profound interest for North Americans of Scottish descent, since it sparked the early pattern of migration from Scotland to the new world. The spring weekend has become the continent's premier Scottish living history event. 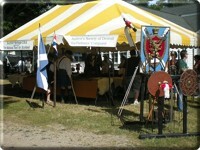 Participation is limited to pre-registered, organized units of re-enactors or clan societies. Organizers work meticulously to ensure that the event is as historically exact as possible, refusing to sacrifice accuracy for drama or spectator enjoyment. Strict clothing guidelines ensure that careful attention is paid to the smallest details, from period-appropriate eyeglasses to the proper footwear. For example, three distinct classes of men in the Highland clan regiments - those on the front line, the middlemen, and tenants and herders - are recognizable by their weapons and clothing. The men on the front lines, for example, are the best dressed and carry long guns, pistols, dirks, short blades, daggers, bayonets, or a targe and sword. 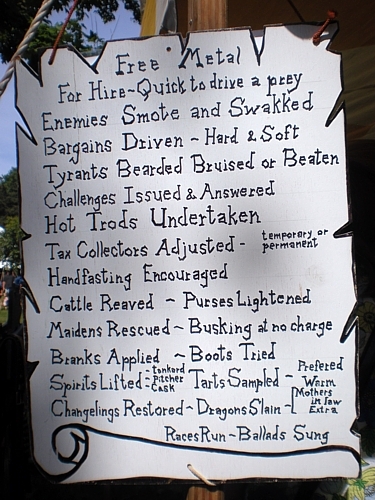 Middlemen are not likely to wield swords or pistols, while the tenants and herders seldom wear coats or shoes, and often have to rely on pitchforks, scythes, or Lochaber axes for weapons. Although the gender restrictions of the era prevent women from being combatants in the field, and there are no reliable records of women disguising themselves as men to fight in the battles, female participants have a variety of roles to perform. The military standard of the period indicates that there was one of these plucky, determined, self-sufficient and adroit lassies in garrison for every ten men, and double that on the march. Officer's wives and Ladies, however, were there only to be with their men or visit Prince Charles, and did not engage in traditional work or associate with the lower classes of camp women, who cooked, sewed, laundered, gathered supplies and firewood, nursed the infirm or wounded, and prostituted. After the first re-enactment, more and more people began portraying actual participants in the 1745 rebellion. In-depth collaborative research efforts have enabled participants to re-enact actual meetings and conversations that took place between prominent characters from the rebellion. 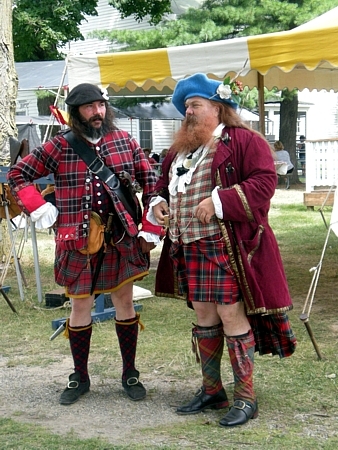 The number of side events has also been increasing annually as clans and individuals develop new ideas for portraying camp life, Highland life, social functions, historical scenarios, clan activities, and characterizations of historical figures. "The 1745 Jacobite Rebellion event has a long history and a recent past," Elliot reminds living historians on the MacFarlanes' Company website. "We cannot rest upon our laurels any more then those we honor could have rested upon theirs." MacFarlane himself has been engaged in this kind of work for more than twenty years. After engaging in undergraduate and graduate work at Bowling Green State University, he continued his education at Case Western Reserve, Ohio State, and Moray University. Although he has to devote the majority of his time to what he calls a "real job" in order to support his family, he works harder at his leisure, traveling across the continent to pursue his passion. His private library boasts a massive collection of eighteenth-century Scottish literature and history, and is complemented by a collection of 125 kinds of single malt Scottish whisky.